in a sentence or so: a choose your path book where you get to be one of the most famous detectives of all time. choose carefully because surprises, and danger, lurk around every turn.you're in a strange room in your uncle's house, spending yet another night trying to power through that stupid math homework.seriously. math is the worst.and then, quite unexpectedly, you find yourself in the place of the famed Detective Holmes. Watson briefs you on three cases that need the good inspector's eye. two of them are innocent enough...but one of them is a trap that just may cost you and Watson your lives. will you be able to make the right choices to solve the cases and save your lives?man, i forgot how fun Choose Your Own Path books can be. this was a super fun book with legit mystery and detective skills. while obviously a middle-grade book, this is certainly one i could bust out with friends and have fun with.and of course, i cheated like crazy. 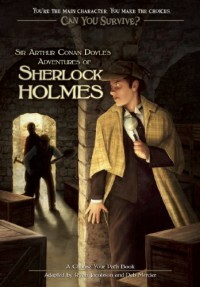 i died no less than 6 times.for a fresh and fun way to experience Sherlock Holmes, i definitely recommend this book! it's a great one to enjoy with friends or kiddos.fave quote: "Anything is better than math homework." (7)fix er up: nothing. this was quick and fun and just right!